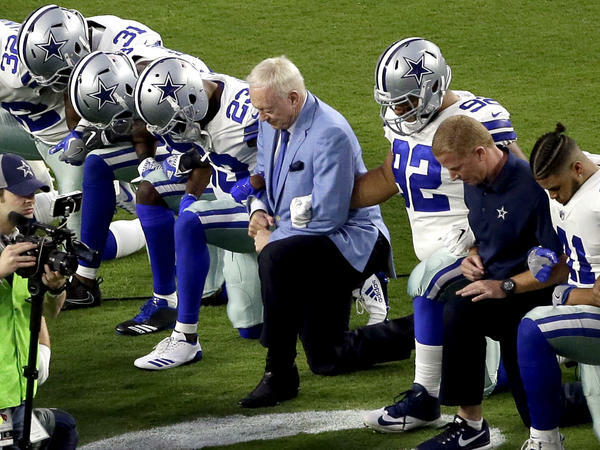 On Sept. 25, the Dallas Cowboys, led by owner Jerry Jones (center), took a knee prior to the national anthem before an NFL football game against the Arizona Cardinals, in Glendale, Ariz. Now he says players who "disrespect the flag" won't play. Two weeks ago he locked arms and knelt with his players before the national anthem, then stood with them as it played. Now, Dallas Cowboys owner Jerry Jones says players who "disrespect the flag," won't take the field. "...If there is anything that is disrespectful to the flag then we will not play," Jones said Sunday night, according to The Dallas Morning News. "You understand? If we are disrespecting the flag then we won't play. Period." Jones did not specify what he meant by disrespect. The players' union responded on Monday, with executive director DeMaurice Smith saying Jones' comments contradicted those of NFL Commissioner Roger Goodell. "I look forward to the day when everyone in management can unite and truly embrace and articulate what the flag stands for, liberty and justice for all, instead of some of them just talking about standing. We look forward to continuing our talks with them on this very issue." Last season San Francisco 49ers quarterback Colin Kaepernick started kneeling during the national anthem to protest of police shootings of people in the black community. His actions drew widespread criticism that he was anti-American. Kaepernick, now a free agent, has yet to be picked up by another team. Other players joined him in taking a knee, and late last month during a speech in Alabama President Trump said that owners should fire the players who protest, igniting a national firestorm. ESPN's Jemele Hill responded to Jones' statement with several tweets suggesting fans boycott the team's advertisers. The sports network responded with a two-week suspension for Hill, calling it the second violation of the company's social media guidelines. Last month the network said that tweets Hill made calling Trump a white supremacist were inappropriate.